After missing over one month with a knee injury, which originated on a collision with the right field wall at Dodger Stadium on May 13, Bryce Harper returned to action on Monday evening and picked up right where he left off. On the second pitch he saw from Milwaukee’s Yovani Gallardo, Harper jumped on a 1-0 fastball and crushed it into the visitor’s bullpen for a solo shot, giving the Nationals an early 1-0 lead and their fans an all too familiar curtain call. Harper homered in his first two at-bats of the season on opening day, jump starting a 2013 campaign that witnessed the young slugger launch 12 homers before going on the disabled list in late May. In all, Harper finished the evening 1-for-4 with the first inning solo home run and a walk in the sixth. Harper was diagnosed with bursitis after reinjuring his left knee multiple times in the weeks following the May 13 collision in Los Angeles. After nearly four weeks on the DL and four rehab games, in which he went 4-for-11 with three extra-base hits at both Class-A Potomac and Double-A Harrisburg, Harper and the Nationals organization decided the time was right for a return to the field. In his absence, the Nationals were 15-15 and in total from the start of the season, Washington has posted a 16-21 record without Harper in the lineup. When the 20 year-old phenom is in the lineup, the Nationals are 26-19. The Nationals now sit six games back of the NL East division leading Atlanta Braves and are barely over the .500 mark with a 42-40 record. 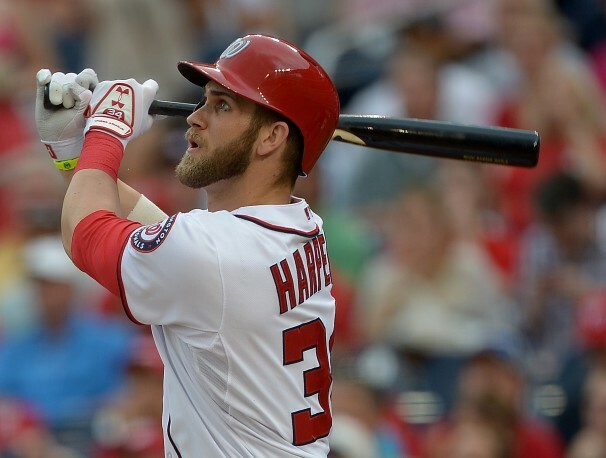 With Harper back and the Nationals in need of an offensive spark to rekindle the passion that drove Washington towards the NL East division title last season, Monday night’s return may be the definitive burst of energy Washington needs to become repeat NL East champions. Washington manager Davey Johnson may just happen to agree with that consensus. Whether his rough-and-tumble, all-out style of play is deemed as either admirable or counter-intuitive is a matter of conjecture. Those concerns will most likely, if they have not already, be sorted out and dealt with by the Nationals. In the meantime, Harper and the Nationals will look to the summer stretch ahead and try to put the pieces together for a potential postseason run.